Belgravia Villas is located at Belgravia Drive. 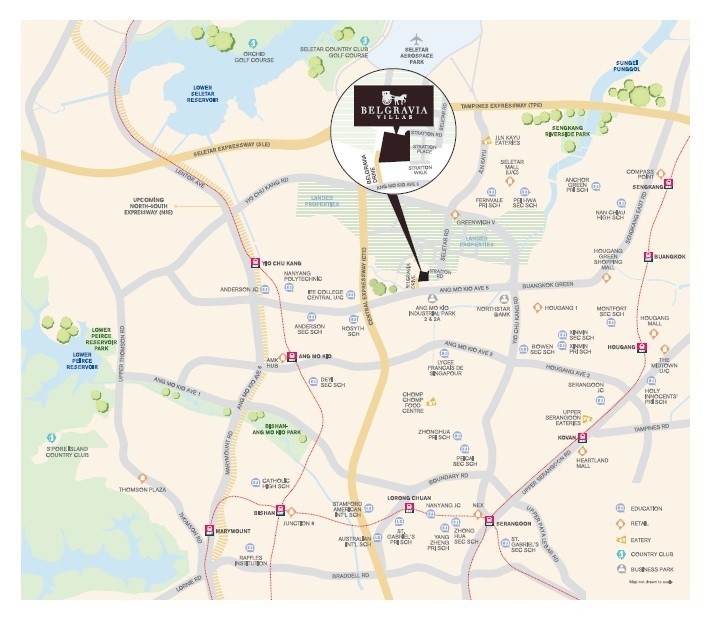 The Belgravia Villas showflat can also be accessed via Seletar Road. Belgravia Villas land site is bounded between the southern tip of Stratton Drive in Seletar and Ang Mo Kio Avenue 5. You are in your Belgravia Villa home and planning that shopping trip with your friend, wheredo you go? Well, Nex in Serangoon, of course. It is a mega mall, has a lot more stuff and a lot more variety than some other malls. It houses NTUC Fairprice and Cold Storage Supermarket under its roof. It has something for every one, the young and the old. It is frequented by students studying nearby. There are lots of eateries and restaurants within its establishment, all kinds of fashion wear outlets, cinemas, IT tech megastores, banks and telcos and so on. And the que que soya bean curd at the basement is a must try. To top it all, under the basement, within the same roof, is the Serangoon bus interchange and the Serangoon Circle Line and North East Line MRT station. Nex is a mega mall and transport hub roll into one. Thumbs up for this great setup. Chomp Chomp is a foodies haunt. It is a great place to eat out. It is teeming with people and the aroma of local delicacies will assail your nose, the moment you arrive. Chomp Chomp is an outdoor set up, The ambience is vibrant with hoardes of hungry people zooming in on their favourite chow. You don't find delicacies and cuisines in Chomp Chomp. You are rewarded with the best Singapore can offer - the ubiquitous hawker fare. These mouth watering food of our local creations are delicacies in their own right. When you dig into your chilli cray fish and stingray, or plate of fried oysters, and the sweat is streaming down your face, you know you are in for a good treat. There is no air conditioning here. You tuck up your sleeves and you eat. There is no need for fine table manners. You are in your raw elements. You are in Chomp Chomp. Just hop into your car with your family. It is not far from your Belgravia Villas home.